This chair is slim line and stylish with a beautiful padded seat and Chrome or Aluminium frame. Perfect for all commercial environments. Special design with a curved back. Modern design bistro chair available in a range of frame finishes and upholstered seat finish. 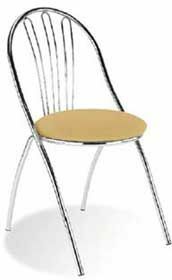 This is a made to order bistro chair with a delivery lead time of around four weeks from order.